This is a cheese infused traditional steamed sponge cake (ji dan gao). 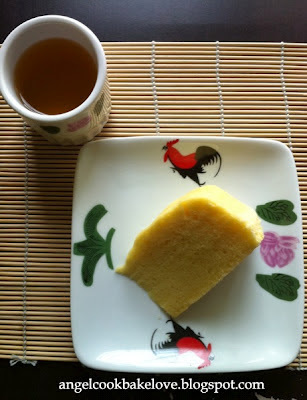 When tasted the next day, I felt like eating light butter cake with hint of cheese flavour. 1) Whip (A) until sugar dissolved and slightly thicken (I beat to ribbon stage). 2) Cook (B) over double boiler until cheese melted. Add it into (A), mix until well blended. 3) Fold in sieved (C) in a few additions, mix well (using folding method) before each addition. 4) Pour into a greased and lined 8”/20cm round tin (I only lined the bottom of the cake tin). Bang the cake tin on tabletop twice to release any big air bubbles (you can also try to level it, I didn’t do that my cake surface was a bit wavy). 5) Steam over medium high heat for 30 mins. Set aside to cool. Optional - spread thin layer of butter on cake and topped with some grated cheddar cheese. 2) You may add extra ½ tbsp Parmesan cheese powder into the batter for stronger cheese taste. 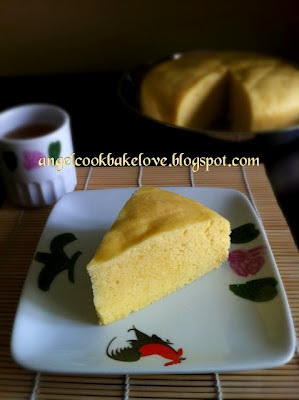 3) Cake can be kept in room temperature for maximum 3 days. Unconsumed cake must be refrigerated. Steam the cake again before serving directly from the fridge. Steamed cheddar cheesecake! I can't recall whether I've seen this recipe in the past & I won't forget yours for a while! steamed cheddar cheesecake sound healthy than bake one, and less heaty! Looks simply delicious...thx for sharing the recipe. This is interesting. I have never tried a steamed cheesecake before. It looks nice. Thanks for sharing the recipe! Definitely less heaty, I can feel it especially for chocolate cake. Actually this is also my first time trying steamed cheesecake. 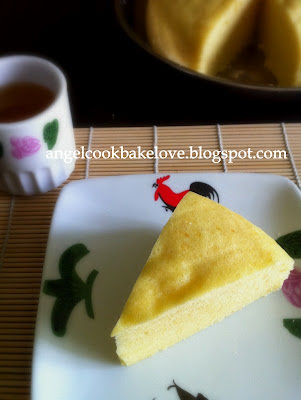 angel, this is quite interesting to me..i hardly baked a cheesecake..but i think i can do with a steam one. Quite interesting to read that it tasted differently after certain time gaps. Kiv-ing this! Do you think we can steam these in individual cupcake liners? How long for if they are cupcake sizes? Yes. You can make into cupcakes. Depending on the size of ur cup, I would think that 15-20 mins will be fine. You would need to test your cake. I try your recipe but why the cake texture is hard no soft. Could you pse tell me the reason? I urgently need to know that. I suspect you have over mixed. When adding in the flour do not you should use fold in method instead of stiring in circular motion. I tried this recipe today but cake came out very hard. My boy say smell very good but can't eat lo! I am sorry to hear that. I think you may have over mixed in step 3. When folding in the flour, do not keep stirring. You have use a hand whisk to roughly stir in 1/3 of flour then use a rubber spatula to fold in the remaing flour. Once you see there is no trace of flour, stop folding. Also, you must make sure the stemaer is ready with boiling water when you put in the cake. Wish you good luck in your next attempt. hi, how to check whether it is cooked? is it insert a toothpick into the centre and comes out clean?